Myeongdong is all about shopping! From the towering super stores of Migliore, Lotte Department Store, Avatar and High Harriet to the cozy, mom-and-pop shops lining the sidestreets, Myeong-dong has something for everyone. Whether the search is for accessories, athletic wear, shoes, boots or a number of other mid-to-high priced items, you’ll find it all here. With the main streets boasting larger, well-known stores, many of the better bargains are to be found at some of the discount stores that require a little walking to get to. All this selection of styles and sizes, coupled with the freedom of strolling in the open-air make Myeong-dong a shopping destination not to be missed and an adventure sure to be remembered. Located in the center of the city with streets sprouting up new stores at an alarming rate, shopping is very convenient. Everything is within walking distance and there is an endless list of restaurants and cafes for hungry shoppers to escape to for a break. Indeed, Seoul has many other shopping districts for visitors, namely, Insa-dong, Namdaemun and Dongdaemun. But whereas Namdaemun and Dongdaemun offer a large selection of discount outlets selling products at low prices, one will be hard-pressed to find the kind of variety that exists in Myeong-dong. Insa-dong is more of a traditional area, full of historic significance, galleries and higher end antique shops catering to visitors looking to come away with wooden carvings, traditional tea sets, or beautiful artwork from local artists. If it’s variety that you’re after, there’s no better place to shop than Myeong-dong where you’ll find everything from internationally-recognized name brands to unique items with lots of personality. Keep reading for a newcomer’s guide to the Myeong-dong shopping district. There are numerous globally-recognized clothing brands to be found in the area—everything from athletic wear to casual and formal apparel. Prices here are mid-range, a little higher than some of the lesser-known shops. Those in the market for trendy athletic wear should head straight to Puma. 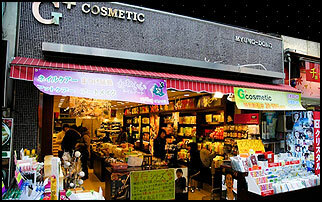 The Myeong-dong location is impressive, boasting a large layout and a wide selection of the company’s product line. You’ll find everything from gym bags and track suits to footwear and jackets. Another brand that has remained rather popular in Korea is American Apparel. The clothing line focuses primarily on comfort and practicality and is a good fit for those with slightly more conservative tastes. Products are known for their good quality and are also popular among those who enjoy working out. Although GAP doesn’t need much of an introduction given its far-reaching global appeal, this particular location is special because it was the first GAP store ever introduced in Korea. Although prices here are a little more expensive than, say, Giordano, the quality is exceptionally good and the clothing line is very diverse. Shoppers will find everything from casual wear to formal wear. The store is a favorite for those looking for bigger clothing sizes. At Myeongdong, there is a famous Spanish SPA (Specialty store retailer of Private label Apparel) call ‘ZARA.’ Just like any other SPA brand, ZARA provides a wide selection of items at affordable prices; new products are stocked twice a week. Prices are around 110%~120% of what you would pay in Europe, but the brand offers slightly larger sizes and a wide array of product lines that range from basic and conservative to vivid and trendy. The first local flagship store of H&M, a famous Swedish SPA brand, the 4-story building (2600㎡) in Myeong-dong has become an incredibly popular shopping spot for internationals and Koreans alike. The 1st and 2nd floors offer a plethora of women’s clothing, the 3rd floor is exclusively for menswear, and the 4th floor is dedicated to infants’ and children’s apparel. Befitting its reputation as a quick-cycling brand, H&M introduces new lines of products every week. The brand collaborates with famous designers such as Sonia Rykiel to add to its products’ artistic and luxurious vibe. Towering high above the streets below are several large department stores that sell everything from discounted items (Migliore and Hi Harriet) to tax-free and luxury brand products (Lotte’s flagship Department Store and Avenuel). Lotte’s flagship Department Store is situated snugly in Myeong-dong. Aside from boasting all the global luxury brand names, one can also find several duty free shops here as well. Avenuel is similar in nature and carries a fine selection of upper-end, higher priced items. Both Migliore and Noon Square are huge discount outlets where shoppers can find numerous styles of clothing at bargain prices. The outlets have everything from accessories to boots and shoes. As an iconic landmark of Myeongdong, Noon Square is a one-stop shopping center full of fashion, food, and entertainment. 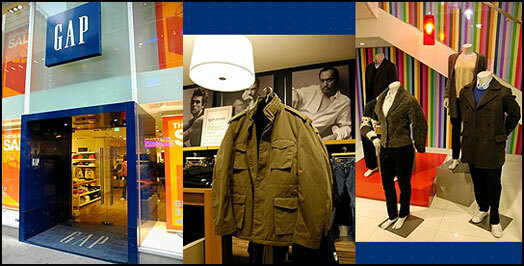 The center houses the H&M flagship store as well as the famous Spanish brand shops ZARA and Mango. Here, a wide variety of brands, both local and international, are available at affordable prices. Dotting the dozens of sidestreets are countless individual vendors selling virtually everything. Some bargaining may be done here making prices along these walkways the lowest in the area. Anyone wishing to grab the best deals or simply experience the traditional market scene should definitely check it out. Purses, cell phone accessories, scarves, hats, and shoes are just some of the things you will find as you stroll around. Be sure to keep in mind that items purchased at blowout or discount sales are often non-returnable and non-refundable. Part of the fun of shopping in Myeong-dong is venturing out to look at all the little shops that are scattered throughout the many sidestreets. One should definitely walk along these lesser known areas to find the best deals and most unique purchases. There are two tourist information centers in Myeong-dong. The first can be found just outside the entrance to Myeong-dong’s underground shopping center, directly across from the Lotte Department Store. The second is a short 500 meters away along one of Myeong-dong’s main shopping streets (Jungangno). Both locations supply maps and various information regarding events and sites in and around Seoul. ● Find out more about Myeong-dong!